Real talk: I think the first time I really (knowingly) ate beets was last winter. I was in Central America with two vegetable-loving amigas of mine, and after weeks of eating out most meals (by “out” I mean at fritangas and hole-in-the-wall places), we were seriously craving some time in the kitchen. 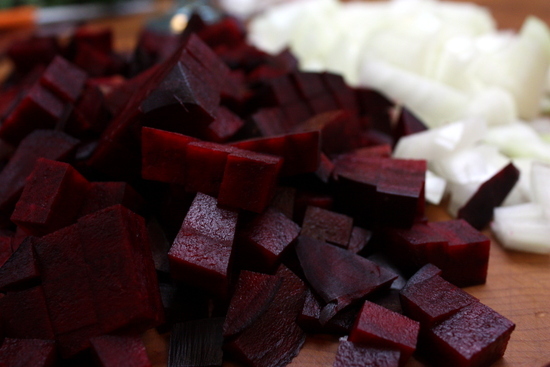 We went shopping and came back with heaps of delicious vegetables: including beets! Rhea cooked them up, roots and greens, and I was blown away! How had I not been eating beets every meal of my life!? Delicious. And fun: who doesn’t like food that leaves you covered in pink? Ever since, I’ve really had to hold back from buying beets at every opportunity — especially because Derek claims to not like them (I’m skeptical). But since he also claims to hate goat cheese, I get to kill two birds with one stone with a dish like this! I’ve been eating this for lunch for the last week — even though I’ve run out of goat cheese and am seriously considering ordering it on Amazon Prime to avoid going to the grocery store. Does anyone else consider doing that? No? Hmm. I first saw this on Eat, Live, Run, linked to Tasty Kitchen, and I knew I had to try it! I know I’m bad about using beet greens after I’ve used the roots, so I decided just to use them in the recipe to add a bit more variety and avoid wasting some precious beet green! Not only was it delicious, but super easy to make. Usually risotto takes much more effort, but this one is not finicky at all, and you can get away with stirring it every few minutes. 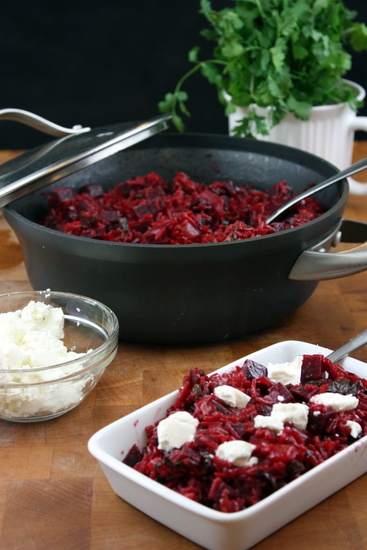 A delicious, earthy risotto that meshes sweet beets with creamy goat cheese. *I used jasmine rice, as I was out of arborio, and it worked perfectly! In a large saucepan, heat the butter over medium heat. Add the onions and beets to the butter, and cook for five minutes before adding the beet greens. Cook for another three minutes, then add the rice, stock, and balsamic vinegar. Cook for 15-20 minutes, stirring periodically. When the liquid if fully absorbed, remove from heat and season with salt and pepper. Serve with fresh goat cheese scattered throughout. Yes! 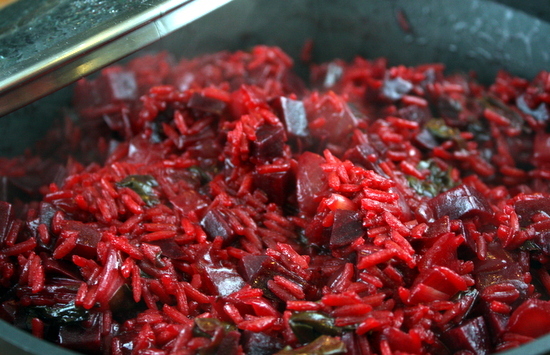 Beet risotto! Isn't it great how all the grains turn bright fuchsia? 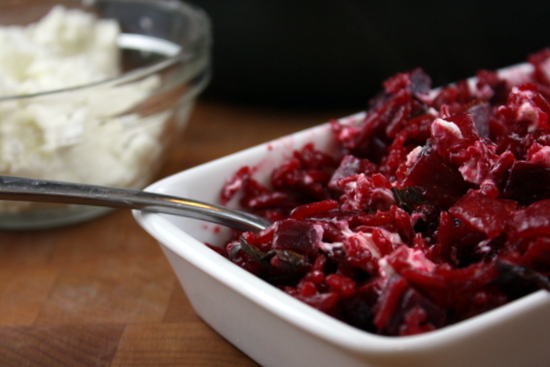 And I love the goat cheese combination–beets, goat cheese, and greens are truly a match made in heaven. that sounds so good. I just bought golden beets without a plan and now I have one!! Everything about this looks amazing!! Hard to beat a good beet.